Overall, the streaming archive user experience is simple and intuitive. Navigating to it was easy - On Demand > Streaming Show Archive. And the options for searching the archive were very clear - by Time, Hosts or Shows and each of the sections has a uses a consistent interaction model. Select an item (for example, Hosts then Cheryl Waters) and it turns yellow indicating it's selected and it also expands to display additional options like show times where you can specify down to the minute where you want the stream to begin. And each level of detail you select also turns yellow so you can easily review what you've selected (yellow and black are part of their palette and they're used effectively). From there, you select a streaming quality and then click the Launch Player button which opens the player in another window. Reference the name of the host when I drill in via Time or Shows. 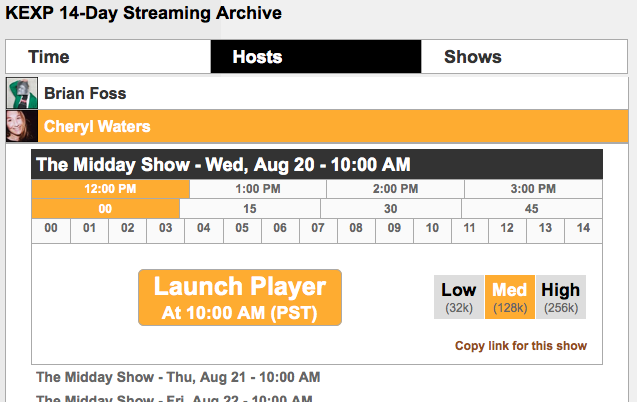 For example, if I select a specific time for the Midday Show (hosted by Cheryl), I expect to see her name and avatar. If I navigate only via Time or Shows, see the host's name would help new listeners draw a connection between the host and the show/time and possibly encourage them to discover more programs for that host.